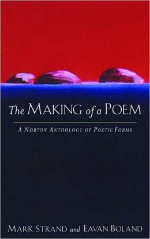 It is hard for me to separate my development as a reader of poems from my career as a poet. If my readings have any acuity or sensitivity, it is probably because I have paid close attention to how my own poems worked, and to which ways and to what extent I might improve them. This mutual dependency is always reflected in the work. A poem will make continual reference to an experience while at the same time call attention to itself as a vehicle for meaning. …good poems have a lyric identity that goes beyond whatever their subject happens to be. They have a voice and the formation of that voice, the gathering up of imagined sound into utterance, may be the true occasion for their existence. A poem may be the residue of an inner urgency, one through which the self wishes to register itself, write itself into being, and, finally, to charm another self, the reader, into belief. It may also be something equally elusive—the ghost within every experience that wishes it could be seen or felt, acknowledged as a kind of meaning. It could be a truth so forgiving that it offers up a humanness in which we are able to imagine ourselves. A poem is a place where the conditions of beyondness and withinness are made palpable, where to imagine is to feel what it is like to be. It allows us to have the life we are denied because we are too busy living. Even more paradoxically, a poem permits us to live in ourselves as if we were just out of reach of ourselves.